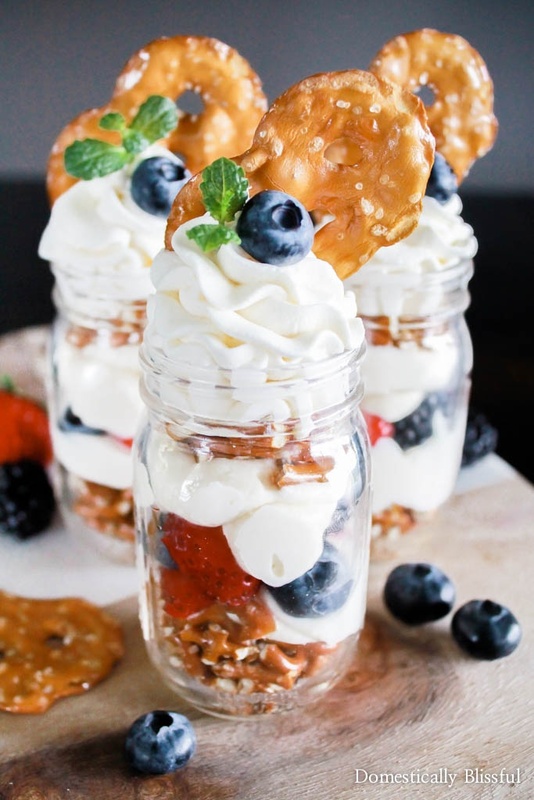 Berry Pretzel Trifles are a simple sweet & salty treat that is filled with fresh & creamy flavors! 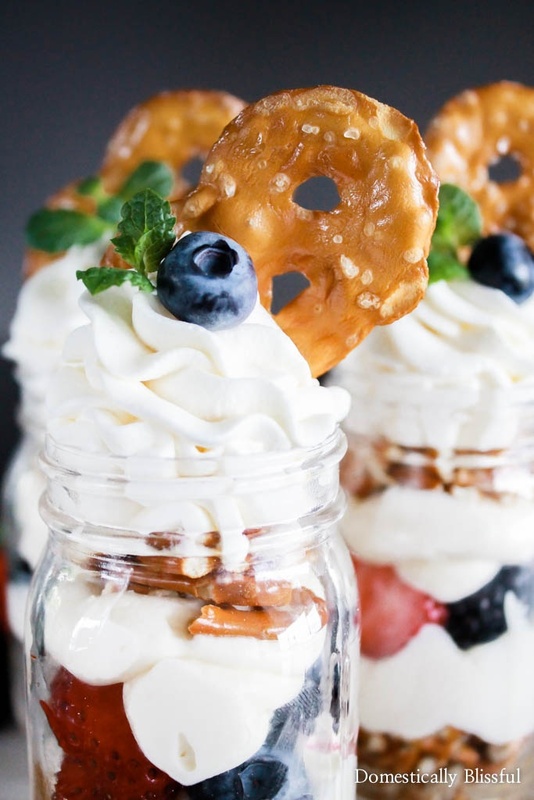 How adorable are these Berry Pretzel Trifles? I can’t get over how cute & delicious they are! Plus they are super easy to make, so you can easily make them for 2, 4, or even for a whole party with your friends & family. I used little 4 ounce jars, but you can serve them in any dish, bowl, cup, or jar you like! 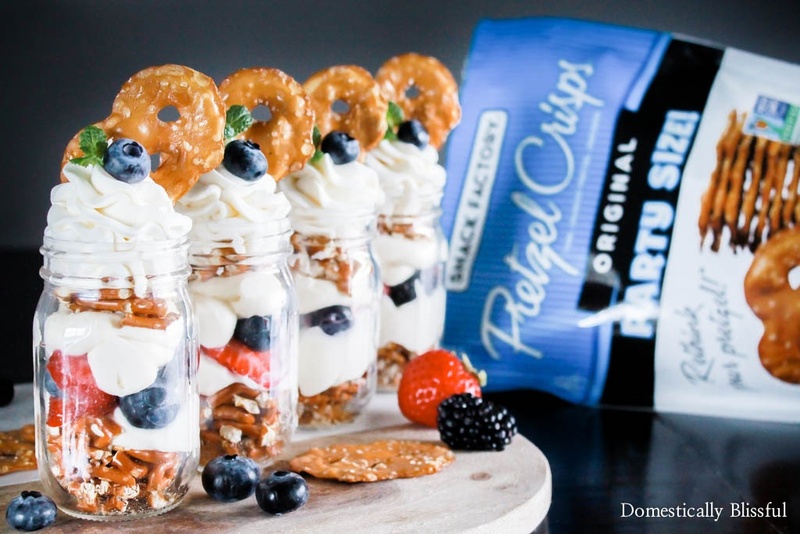 And I love the layers of Snyder’s of Hanover® Pretzels, fruit, whipped cream cheese (almost like cheesecake), homemade whipped cream & topped with Snack Factory® Pretzel Crisps®, a berry, & mint. It’s the perfect snack treat for everyone. Perfect for sharing the love! 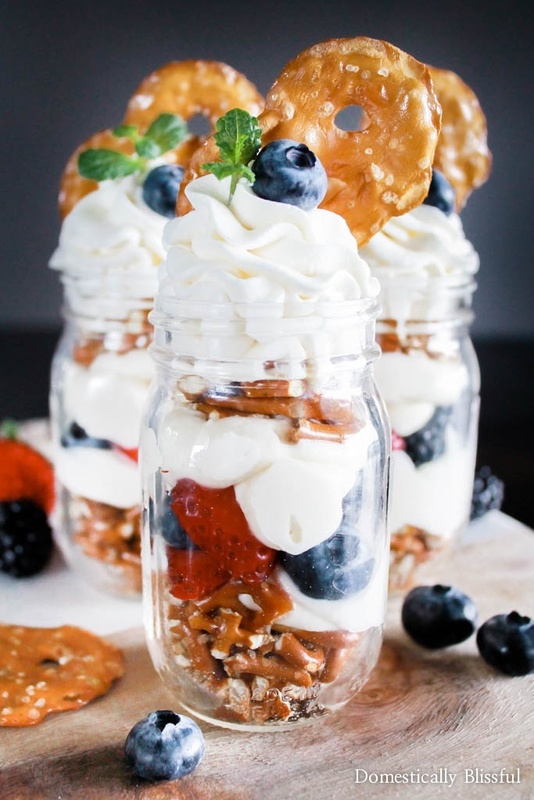 I know Trifles are traditionally a dessert, but something about these individual Berry Pretzel Trifles seems like they would be good for brunch too! Pretzels are good all the time, especially Snack Factory® Pretzel Crisps®, fruit is definitely good at breakfast, & people top their cinnamon rolls at breakfast with cream cheese icing. So why not include this treat for brunch? Personally I think these would be perfect for a brunch, especially for a wedding shower or baby shower brunch. They are a perfect sweet & salty brunch treat! And at the same time, they would make a delicious cold treat to cool off with after a hot day, maybe even serve them at a party BBQ or family gathering. I picked up my Snack Factory® Pretzel Crisps® & Snyder’s of Hanover® Pretzels from Walmart & Roger & I have enjoyed snacking on them all weekend. We took them with us up to the Smokey Mountains for our picnic on Saturday & we brought some with us for our picnic after floating down the Hiwassee River on Sunday. They are perfect for satisfying everyone’s summer snack cravings! I love that you can use Snack Factory® Pretzel Crisps® for any summertime treat! They offer creative ways & limitless summer recipe opportunities for snacking while sharing great taste & great times with family & friends. You could use them in these trifles, in brownies, cheesecake, dipped in hummus, while on the lake or camping up in the mountains. The options are endless!! And they are made from simple, high-quality ingredients too! 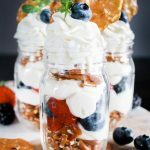 You can enter below or by clicking here & you can find the recipe for these Berry Pretzel Trifles below! Something I discovered after making this is that you can make them ahead of time, keep them in your fridge, & then serve them later, completely chilled. After I made them I stuck them in the fridge so Roger could see them when he came home from work. Even the whipped cream on top looked exactly like they do in these pictures when he came home. So you could easily make them mid-morning, chill them in your fridge, & then serve them to your guests in the evening. It’s always nice to have a fancy looking dessert all prepped & ready to eat once the main meal is complete! 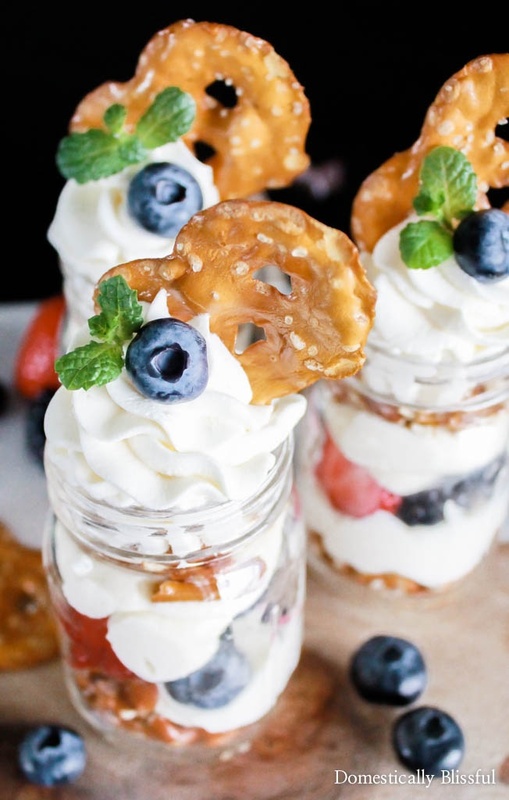 And these Berry Pretzel Trifles are sure to delight you & all of your guests! First, place 1 cup of Snyder’s of Hanover® Pretzels in a plastic bag & crush them with a rolling pin into little pieces & set to the side. In a separate bowl, whip the softened cream cheese, 1/2 teaspoon vanilla extract, & 1/3 cup white sugar. Then add 1/2 of the homemade whipped cream to the cream cheese & blend it together. 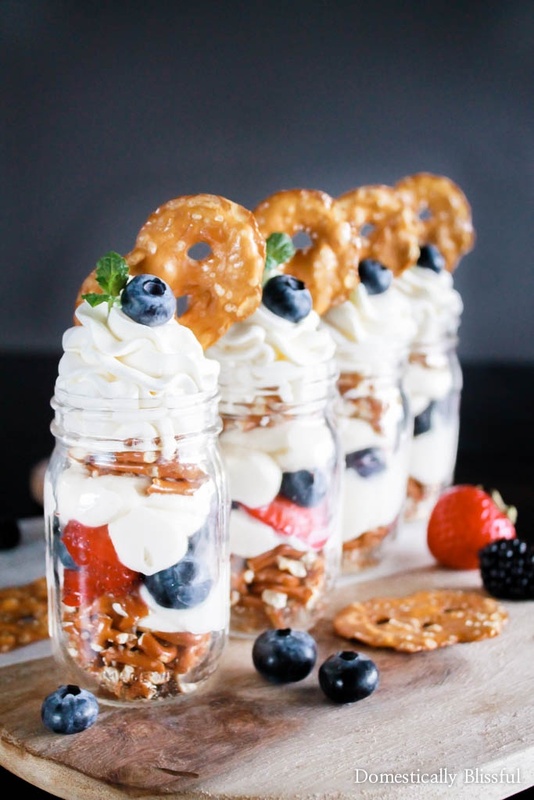 In the individual jars (or cups or bowls), layer the crushed Snyder’s of Hanover® Pretzels, whipped cream cheese, fresh fruit, more whipped cream cheese, a second layer of crushed Snyder’s of Hanover® Pretzels, & then top with the whipped cream, berries, mint, & a Snack Factory® Pretzel Crisps®. What is your favorite way to eat pretzels? These look like heaven!! i must try the! This looks AMAZING!! I never thought to add pretzels but its super appealing. This is such a good idea! I love salty and sweet. and they’re pretty! Oh my goodness. These look too good. we have so many raspberries growing right now, and this would be a great way to use some of them up! Thank you, Danielle! I hope you get to make these Berry Pretzel Trifles with your fresh raspberries really soon! I’m a huge fan of fresh fruit and berries. i love the sweet and salty combo. yummy! Me too! Sweet & salty is such a delicious combo. Okay, these are THEE cutest! Love the salty seet combo and the adorable presentation! Thank you, Felicia! I totally agree!! This looks delicious, I would never have thought of layering pretzels and cream! Thanks, Sarah! They are so good & easy to create! I love pretzels, and this combination sounds so good. This would be a perfect treat at a 4th of July picnic! This trifle looks absolutely DELICIOUS! I can’t wait to make this treat! 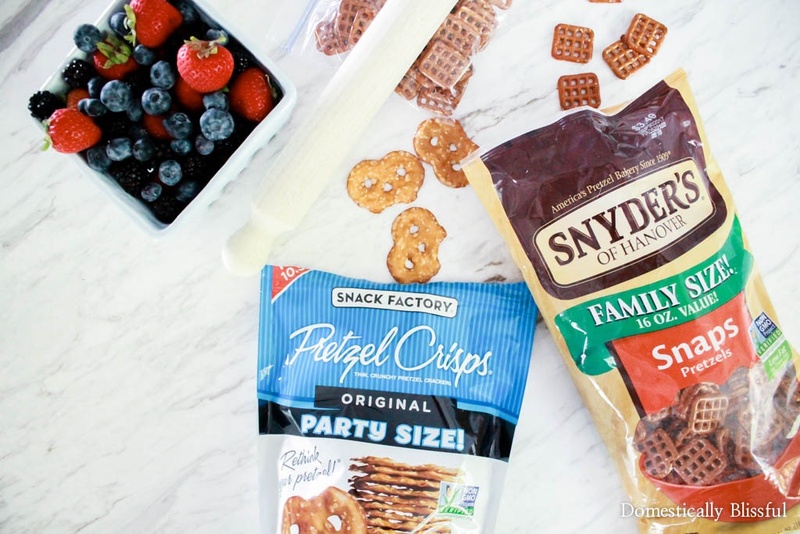 We love snack factory pretzel crisps, and snyder’s pretzels too! Thank you, Amanda!! They are so good & crisp! I hope you enjoy your Berry Pretzel Trifles!